The super-high-end of Intel’s Xeon CPU range, based on servers with as many cores and as much memory as you can throw at them, represent a good part of Intel’s business with the potential to offer large margins: some customers want the most, the best, the powerful, and are willing to pay for it. For a number of generations, this has come via the Intel E7 line, consisting of two families of products designed for quad-socket servers (the E7-4000 v4) and eight socket servers (the E7-8000 v4). The new element to this launch is the use of ‘v4’, meaning that following the launch of Broadwell-EP for 1S/2S systems a couple of months ago and Broadwell-E (high-end desktop, HEDT) two weeks go, Intel has now filled out the v4 product line as we would typically expect. 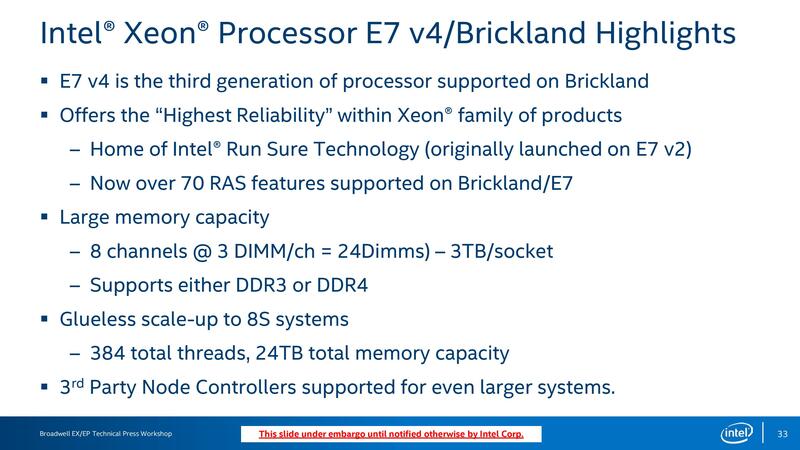 The new Xeons will be under the Broadwell-EX nomenclature (following Haswell-EX, Ivy Bridge-EX and so on), and using the Brickland platform aimed at mission critical environments. Intel currently runs several processor lines in the Xeon/enterprise space, from E3-1200 v5 processors using consumer level performance in a Xeon package, the recently released E3-1500 v5 processors with embedded DRAM to help accelerate visual/video workflow, all the way up to the large EX core platforms. As referred to in Johan’s very detailed review of the dual socket E5-2600 v4 platform, Broadwell Xeon processor dies come in three die sizes: a low core count (LCC) featuring ten physical cores at 246.24 mm2 for ~3.2 billion transistors, a medium core count (MCC) with fifteen physical cores at 306.18 mm2 for ~4.7 billion transistors, and high core count (HCC) with 24 physical cores at 456.12mm2 for ~7.2 transistors. The MCC and HCC arrangements use dual memory controllers to address four memory channels whereas the LCC die uses a single memory controller which results in a slight performance hit compared to the other two. 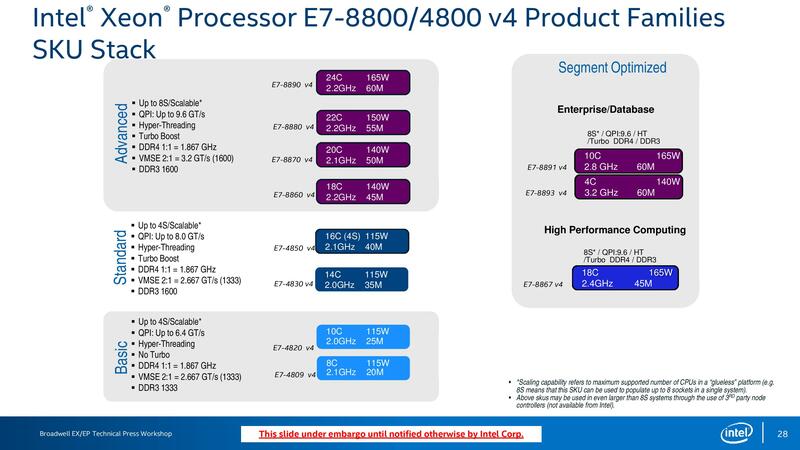 Most of the new E7 v4 processors however will be using the HCC die. Intel has formally announced eleven processors between the 4S and 8S families, varying in core count, frequency, power consumption and L3 cache. The design of the HCC core is such that a processor can have certain cores fused off but the rest of the die can have access to the L3 cache, providing some SKUs with more ‘total cache per core’, such as the E7-8893 v4 which will be a four-core design but with 60 MB of L3 cache between them. These are classified by Intel as 'segment optimized', where applications require faster cache rather than more cores. 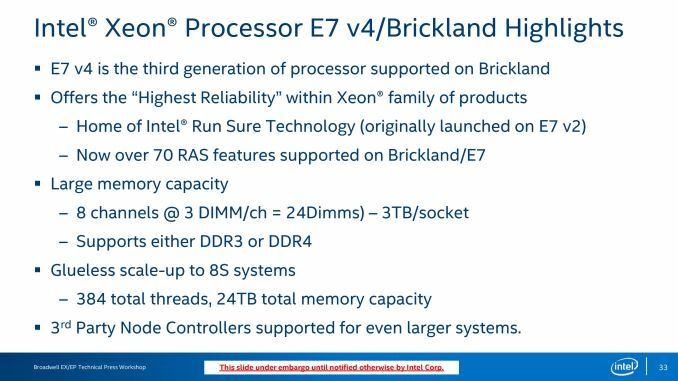 This is arguably a stone-throw away from an eDRAM SKU with 64MB of eDRAM, but in this case Intel is still going with a large (and faster than eDRAM) L3 cache. The flagship model is the E7-8890 v4, a 165W processor supporting the full 24 cores in the HCC die with hyperthreading, offering 48 threads per CPU. At a base frequency of 2.2 GHz, this processor can be used in an eight-socket glueless configuration (an 8S implementation means 192 cores/384 threads) or up to 128 sockets using third party controllers. In the eight socket configuration, a system can support up to 24TB of DDR4 LRDIMMs (three modules per channel, 12 modules per socket, 256GB per module). All the CPUs listed will support DDR4 and DDR3 with the dual controller configuration. The E7-4800 v4 line by comparison will use a reduced QPI speed (6.4 or 8.0 gigatransfers per second compared to 9.6 gigatransfers per second on the E7-8800 v4) as well as some of the family having no Turbo frequencies. These non-turbo processors will run at their given frequency no matter the loading. Entry/Exit latency for virtualization environments reduced to ~400 cycles from ~500 cycles. There are a couple of features for the HCC based processors that may be more relevant for the 4S systems, such as an upgraded version of Cluster on Die. Due to the configuration of the die and the dual ring design, if a core needs data in an L3 cache on the other side of the die, the latency would be higher than if it was closer to the die. 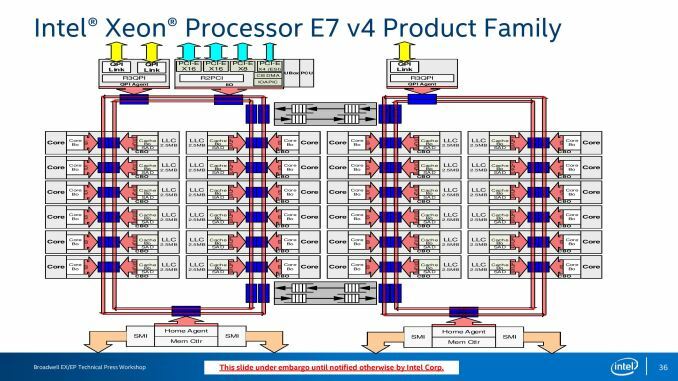 To alleviate this, Haswell E5/E7 Xeons separated each die into two clusters such that each part would be seen by the BIOS as a non-unified memory domain. This allows the home agent/system agent to manage the likelihood that memory requests are aimed at data closer to the core that needs it. 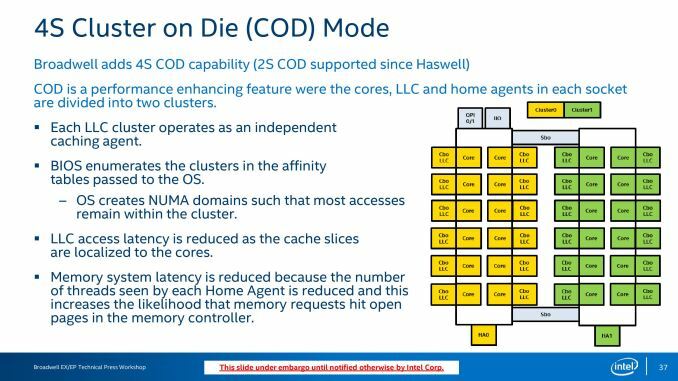 In Broadwell, this feature is now brought up from dual-processor systems to four-processor systems, and should reduce last level cache latency and performance for larger systems. The new E7 v4 processors use the same socket as the previous generation, the E7 v3 processors. With a BIOS update, the new processors are a drop in with the older platform. The usual Intel partners (Supermicro, HP Enterprise, Dell, Cray) are expected to offer systems based on the new processors. We expect the new processors to cost in line with the previous generation with a typical generational increase. I believe Johan is currently in the process of testing a few parts, and I’m looking forward to the review.